I am about to hopefully destroy any form of negativity that you could possibly have been brainwashed with via recent STV or tabloid 'sensationalism' whether from a completely clueless newsreader or from the 'natural' negativity from a 'cup half empty' ghillie. I'm also hopeful to assist in setting your mind free to a degree where your gut, eyes and good old common sense form the basis of your assessment of this truly amazing Scottish pursuit. To be perfectly frank with you Scottish salmon fishing as far as I've ever seen has to date been a completely wasted opportunity to 'show case' one of the most visual & naturally fascinating pursuits in the entire world. Why this fabulous business has been allowed to be represented by extremely low grade presentation by our Scottish Government is completely beyond me but then again respect for politicians has always been something I've personally struggled with as none of them seem to have a 'genuine' interest in anything other than your vote. They say we are in a salmon stock level downturn but I'm not convinced as the only measure we have of Scottish wild salmon stock numbers are by how many salmon anglers show up on the river to attempt to catch one! How can this be the only measure you may ask for something that's of such huge importance to Scotland and its rural economies. This may well be the only business in the world where if an audit was conducted no one would ever be able to quantify the true stock position. These days salmon anglers come to the rivers of Scotland with varying degrees of salmon fishing skill so obtaining a stock position when many beats are only 25% let each year is a seriously flawed measurement tool indeed. As a boy fishing on the River Tay one of the most frequently used words I heard from my late mentor was 'cyclical' and I was assured that during periods in the 1930's there were periods where few salmon were present in the Tay. A big part of the attraction of catching a wild salmon is the challenge of doing so but if you add in the dented ego of an unsuccessful salmon fisher who maybe hasn't even bothered to take a lesson on pre proven salmon fishing tactics then you could easily understand a negative knock on effect. As an example of the other side of the coin one of my professional guide team this year had over 120 salmon to his own rod for the season! Marketing Scottish salmon fishing should never have morphed into being all about fluctuating & flawed 'catch statistics' as turning up on a river where every salmon fisher was catching too many fish each day would surely lose its appeal very quickly. Debeers do not release their vast diamond stock piles to the market place but instead feed these little pieces of carbon out in carefully considered quantities in order to preserve 'perceived value' which this tactic achieves. Just supposing the guesswork of ghillies and fishery management who cannot see what sea or river stock there is were correct and that the Autumn run this year just didn't even appear in the closed season as it's been doing since ice stopped forming on our rod rings in September many decades ago. This dip in stock numbers should increase the value of the pursuit as this industry has never been able to guarantee the capture of one of these fine fish from what I've ever seen. 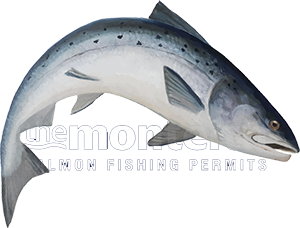 A guided salmon fishing package including the services of a top professional who rarely blanks should be marketable at an absolute premium. Get a grip ghillies and fishery management and see the potential upswing like Debeers did of a naturally or unnaturally occuring dip in stock numbers. At the same time self assess your own marketing contribution to the industry that supports you and ask yourselves the question have you done your best to promote it or nothing at all. A team of wild horses couldn't drag thousand of us away from the Scottish salmon rivers even if we knew there was only one salmon there to be caught!